Happy Fourth of July all! 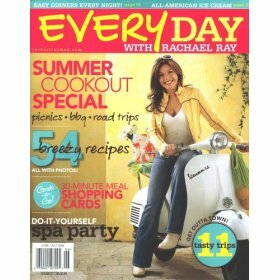 I hope you have a wonderful day and that you spend it making Rachael Ray recipes. When you blog about them, send me an email at everythingrachaelray at gmail dot com and I will make sure to add your post to the Friday roundup. Now, onto the usual Rachael Ray stuff! I liked the approach, but found it almost too simple. If I'm going to the trouble of making this, I want it to be a meal. Which isn't to say there's much room for tinkering. Add too many ingredients and this becomes a casserole. The seasonings work well, so I kept those the same. And since cheese goes so well with potatoes that was a must. I opted for Manchego (a mild Spanish cheese), but any grated hard or semisoft cheese would work. For flavor, I added yellow onions between the layers of potato. For this to work, the onion must be thinly sliced, so I suggest using either a mandoline or a food processor. You want the onions to be thin enough to almost melt during cooking. I also liked the idea of greenery, as much for color as for taste and nutrition. Fresh baby spinach seemed a good choice. A thin layer of fresh leaves between the potato layers wilts down nicely during cooking. I kept toppings simple, adding a few diced red peppers to spice things up. Black olives or sliced button mushrooms also would work. Since I added so much cheese to this recipe, I decided to cut the butter from Ray's version (it calls for a whole stick). Olive oil cooking spray works just as nicely. I could not find the recipe on the website for Every Day with Rachael Ray, but the author provides the tweaked recipe in the full article. Remember that you can do this, too. Any Rachael Ray recipe can (and should) be tweaked to fit your tastes.